I have heard it is rude to tip with pennies. Whenever a check at a restaurant comes and pennies are part of the change, I take out the pennies and then leave the tip. I saw a friend once do this many years ago, and I adopted the same practice. So if pennies are rude to give servers, then why in the world do some old ladies insist on giving them to trick-or-treaters? 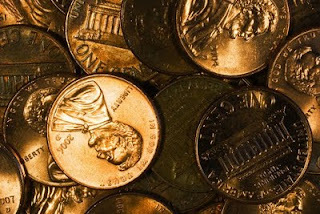 In neighborhoods across America, pennies still are given, even though that is the worst Halloween treat of all time. Miraculously, neither of my daughters - Sophie (a cupcake) and Chloe (red dragon) - received any pennies this year trick-or-treating. I attribute this to the fact that Long Beach, Calif., is a socially progressive city. Back in my preteen years, I remember receiving 10 pennies from an old lady for Halloween. As she dropped them into my plastic pumpkin, I remarked, "Ooh. I'm rich now." The woman beamed, thinking I was serious. I sort of felt badly because of the sarcastic remark and engaged in a conversation with the woman. It turns out that she gave small candy bars, as is the convention, in tandem with pennies. She had run out of the candy bars. Ultimately, I have learned not to judge old women, their smells or penny giving. Sure, I'm not a fan of the pennies, but I guess there are worse things to give trick-or-treaters, including unwrapped treats that go straight into the trash because of the odd fear that they may be poisoned.